Joining the military is more than just finding a job — it’s an entire lifestyle. With military training, travel and military promotions testing, service members are often exposed to situations other people just read about. Luckily, it is possible to translate real-world experience into college credits. Online college degree programs designed for military members and their families have incorporated “testing-out” options into their programs. Testing out enables students to get college credits without buying the textbooks, doing the coursework and demonstrating subject mastery through a comprehensive exam. This is yet another way online schools and degree programs have stepped up to meet the unique needs of the military lifestyle. How Can I Test Out? There are several different exams available for military students who wish to test out of a particular subject. Base education offices stateside and at deployed locations offer testing options, study guides and test proctoring on a regular basis, and most online college degree programs offer a seamless review process for test grades. Best of all — many education offices have funding for these tests, so free college credits can be a real possibility. The College Level Examination Program is the most well-known college credit examination offered. With 34 subjects available and a possibility of earning three credits per exam, taking the CLEP is a cost-effective method for advancing the college degree process. The CLEP is offered as a computerized and proctored test. Scores are graded quickly and can be sent directly to the college or university of choice. Many online degree programs and universities have the process for accepting CLEP credits streamlined for military students. Formerly known as the DANTES Subject Standardized Tests, the DSST is a series of tests developed as a part of the DANTES program to help service members gain college credits for training done on active military duty. There are 37 DSST exams approved by DANTES. DSST exams are meant to represent a final exam in each offered course, with three credits possible for each test. Scores can be directly forwarded to the online university of choice. The Excelsior College Examinations are yet another option available to students wishing to test out of traditional college and university classes. There are currently 53 ECEs available, and they are offered free to military personnel through the DANTES program at base education offices. Many traditional institutions have balked at accepting test-out credits in the past, but most online universities strive to make the degree process as versatile as possible for their students. Not only do accredited online degree programs work around duty and deployment schedules, but they also recognize the real-world experience and unique skills service members and veterans possess. The testing-out option is only one of many opportunities online universities and degree programs offer that recognize the different skills and expertise of their students. 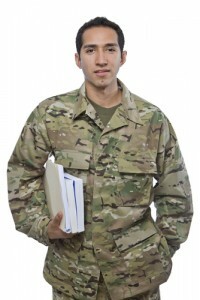 Will the online university accept credits from a military proctored exam? Not all online degree programs and universities accept credits from every test-out option. Before you take the time to study and sit for the exam, make sure your school will accept the results toward your degree or certification. Are you ready to move into a higher-level class even though you don’t have the college credits for it? Perhaps you were stationed in Italy and studied conversational Italian at a base facility. Why slog through Elementary Italian when you have the skill set to move straight into a higher-level course? Most online degree programs will not only grant the credits when you choose to test out, but they will use the mastery of the subject you have demonstrated to place you in the appropriate level course. Which tests are offered at your base education office? Because online college degree programs have structured themselves to work with the military lifestyle, cooperation with military education programs is a focal point for them. Not only is it more convenient for service members to take their tests on base, but this option can often save them money and frustration. Base education offices often have funding for CLEP, DSST and ECE and are practiced in getting the test scores where they need to go.